OK, so hopefully you've seen the new game trailer for Lifeless Planet and you can't wait to do some extrasolar planet exploration! Lifeless Planet is a totally independent game project by a very small team: in fact, all of the production so far has been by one guy (me!). The goal is to make the best possible 3D action-adventure game on a small budget using free and low-cost tools. In the past some truly great games have been created by lone developers with a passion for their work. What's amazing is all the new tech that now allows independent studios to create incredible 3D games. To pull this off, I will need your help. Even with great new tools out there like Blender and Unity, it takes a massive amount of effort to produce a quality game. I've spent years (decades, I'm afraid to say) learning 3D modeling and animation, texture painting, and game programming. I've got a "real" job, but interactive applications (i.e. gaming) are my passion. I'm pouring my heart and soul into this project. All of this takes time, and yes, time is money. 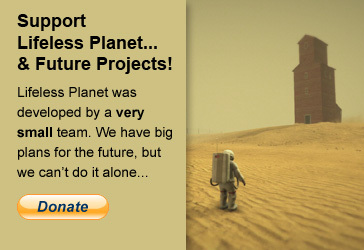 So very soon I hope to launch a Kickstarter project to allow fans of Lifeless Planet to contribute to the cause. In the meantime, the only thing I ask of you is to sign up for the free newsletter! I will keep you updated on project milestones, new trailers, betas, etc. 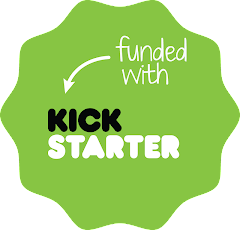 And when the Kickstarter project launches, I'll let you know so—if you like—you can support the project and get great perks like pre-orders of the game and cool Lifeless Planet swag! Lifeless Planet First Game Trailer is Live! Please let me know what you think of the trailer and watch this site for more info. soon...including pre-order details!